I therefore want to EMPHASIZE that it is mostly not something I have figured out because of my savvy or horse sense, but which I have had the privilege to learn from smart horsemen whom God brought over my path over a period of more than forty years, and mostly, because of what He has revealed to me by grace. 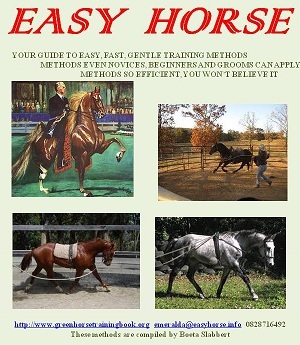 I’ve read quite a few books on Natural Horsemanship, and watched quite a few DVD’s, but the problem with many of these is that they show you the end product and result, but NOT the step-by-step way of getting there from Day 1. 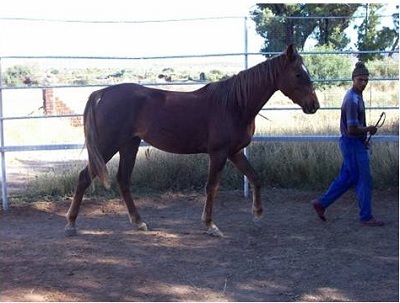 Any course or book should endeavour to guide you step-by-step, from the day the foal / young horse is brought in from the veld, the individual which has never been handled before, till completion of the process of bonding. For the purpose of this course explained in the training manual, EASY HORSE, we also assume that the horse is of the spirited type. Many horses will allow you to proceed much faster, but I want to help you, the novice, the amateur, to be able to bond with any type of horse. It can take you as little as twenty to thirty minute to sit in the saddle of horses which have never been handled before. However, don’t expect to do this from the start, but with the right guidance it is something which can be learned easily. Won’t you feel good if you can do that? And the good part is – it is not a mystery, it is much more plain and easy than you can ever imagine. To me one of the surest signs of a lack of understanding of equine psychology, or the way a horse thinks, is “He will do as I tell him”, a sure sign of arrogance, but not of horsemanship, unless it is said by a true professional, who knows why he says it, and what to do. It is amazing that this attitude will mostly be found among amateurs with little or no experience, and who normally ruin most of the horses they get involved with. It is just logical that a young horse which comes in for the first time, will be suspicious of EVERYTHING. EVERYTHING is new and strange to him. Even being stabled is a foreign experience. Understanding the way a horse experiences everything opens doors for you as trainer. On that first day he doesn’t know what to expect, and his only safety lies in defense. As far as he is concerned you might hurt or even kill him, and he has to protect himself. So, your first goal should be to convince him that that is by no means your intention. Prove to him that you want to protect him against anything which might harm him – that he is safe with you, and that you will not do anything that will harm him. Get it to run to you for protection – you are his ally and friend. Sweet baby talk will not do that. A horse forms an opinion of you by your acts and not by the words you use. Knowing which acts convey which message to the horse, and understanding what he tries to say to you by certain motions and actions, are the keys to mutual understanding. Once you’ve accomplished that, you’ve made the essential breakthrough which is so crucial for the rest of that horse’s life. If that horse trusts you, anything you introduce to it will be accepted easily. However, if you hurt it, fight with it or force it into any threatening situation, you’ve laid a secure foundation for insecurity and distrust which will take a long time to overcome, if ever, and which will complicate your future training tremendously. The key to success is understanding and knowing the way a horse reasons and what it is trying to tell you by certain actions and signs. It is only by an intensive study that this knowledge is being revealed to a horseman. Fortunately, this is something which can be taught easily. Once you have found an experienced, sincere, reliable and knowledgeable tutor, you are on your way to success.